​Nuts from hybrid and American hazelnut shrubs generally do not fall free from the husk like they do from European hazelnuts. Thus, the clusters need to be picked from the bush. At this stage most growers in the Upper Midwest have small plantings and do the harvesting by hand. Based on our time trials in the Bayfield planting, we estimate hand harvesting can be done at a rate of 13 lbs in-shell nuts per hour. Ultimately, harvesting will be mechanized and some larger growers have been using a blueberry harvester that travels over the row and uses sway bars to detach the clusters from the shrub. 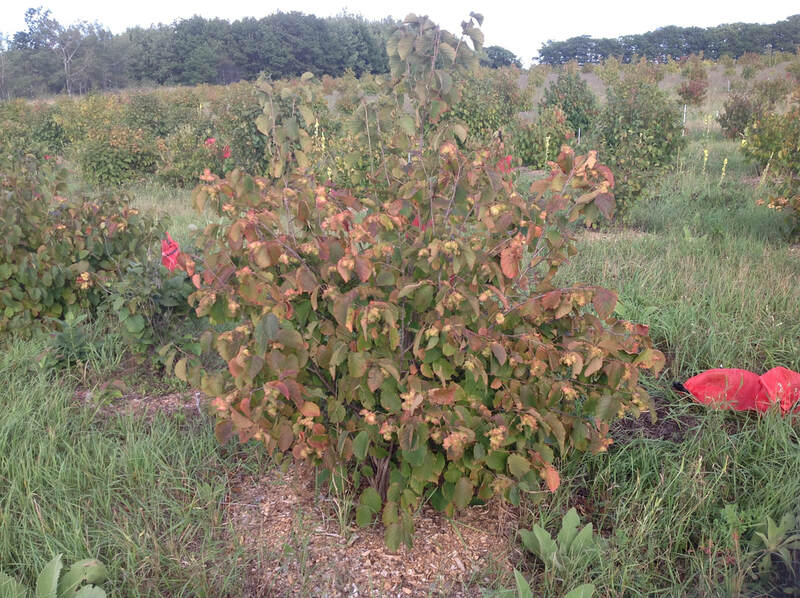 Our Research Team is currently looking for funding to optimize aronia harvesting equipment for shrub-type hazelnuts. ​Because the nuts do not fall free from the husk from hybrid or American hazelnuts, they must be mechanically removed from the husk. The longer they can hang on the bush to dry the better, but because wildlife love to eat hazelnuts, most growers will pick as soon as the nuts have abscised and are loose in the husk. This means the husks are still green when picked. Although there is equipment to remove the husks when green most growers are drying the in-husk nuts and using beaters of some kind to remove the dried husk from the in-shell nuts. Eventually, the goal is to incorporate removal of green husks into harvesting equipment so de-husking can happen in the field as part of the harvest process. 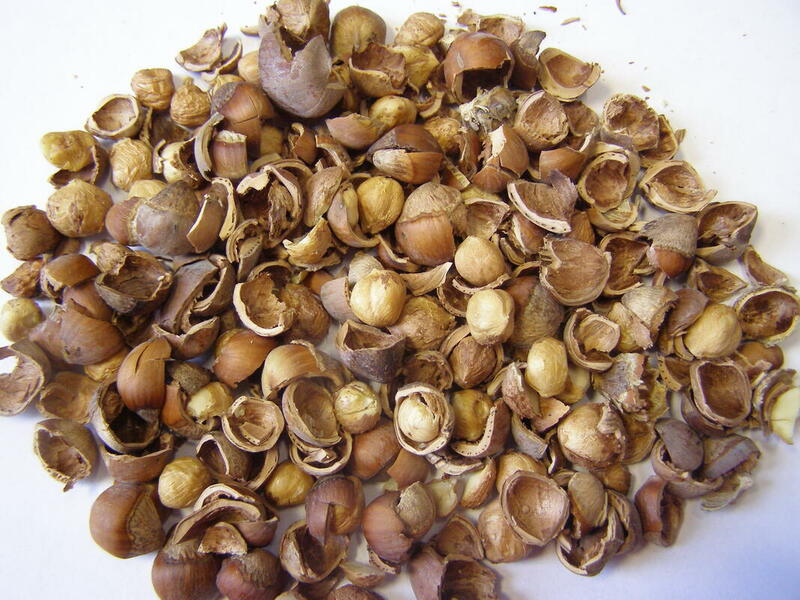 ​After de-husking, the in-shell nuts may require additional drying and sanitizing to ensure viable storage. Nuts with husk still attached (stick-ons) must also be removed. Once cleaned, the nuts are then separated into size classes using a roller-sizer or barrel-sizer. De-husking, cleaning, and size-sorting in-shell hazelnuts is considered part of the harvest process and no food processing license or inspected facility is necessary. The in-shell nuts may be sold directly to consumers or wholesale to retailers. ​In-shell nuts can be stored for more than a year and cracked as needed. Cracking is done in two ways: compression cracking with the nut squeezed until the shell cracks or impact cracking with the nut thrown against a hard surface to crack the shell. The cracking process produces a mix of whole kernels, split kernels, half-cracked nuts, and shell fragments. The goal is to maximize whole kernel crack-out as separation of split kernels from shell fragments is challenging. ​The goal of post-crack cleaning is to separate the whole and split kernels from the shell fragments, uncracked, and half-cracked hazelnuts with as little labor as possible. There are many different ways to accomplish this, but the process typically includes mechanical sorting and aspiration. The video at right shows a vibratory feeder dropping in-shell nuts into a compression cracker and the post-crack mix being passed under vacuum aspiration to remove the shell fragments. ​​Hazelnut processing regulations vary by state. Before selling hazelnut kernels or food products made with hazelnuts always contact your state's Department of Agriculture to determine exactly what licenses or permits may be necessary. Regardless of required licenses food safety should always be a priority. There are examples in all nut industries of consumers getting sick from eating nuts contaminated with food borne pathogens. A HACCP plan (Hazard and Critical Control Point) for your nut processing is always a good idea. In Wisconsin, in-shell nuts can be cleaned, sorted, and sold direct or wholesale without a license. Cracking and cleaning are considered food processing and selling kernels therefore requires a food processing plant license. Obtaining that license requires conducting the cracking in a facility and with equipment that meets WI food code. In Minnesota, a food processing plant license is also required, however the MN Cottage Food Law provides exemptions to the requirement for small producers selling direct to the end consumer.